Mark and his team did a rather involved exterior project on our home which primarily focused on changing the appearance of the three-story addition on the back of our home. The original addition had been placed by our previous owners and had a barn-style roof, aluminum siding, and recessed windows that leaked terribly. It did not fit with the overall style of our home, which is a tudor style cottage. We really came to Mark with no vision whatsoever, other than that we hated the look of the addition. He came back to us with several options, all of which looked amazing. He provided us with paper sketches as well as the 3-D computerized images that allow you to see what the structure will look like from all angles. He used a combination of stucco and composite shingles styled to look like cedar shake to blend it into the rest of the house. The most challenging portion of our project was adding stucco to the back of the house to make sure that it was really tied in with the rest of the house. We did not start our project til late summer, and cold weather came early that year. Despite pressure from the village where we live, Mark insisted that it was best to wait until the following spring when the temperatures were more reliable as putting stucco on in cold, wet weather would increase its risk of failure. I am really grateful that he did that. All in all, we are delighted with the work Mark did. This was the largest project that we undertook since moving into our house and every time I drive up to our house I am amazed at how beautifully the addition now blends with the rest of the house. I would use Mark again without hesitation. We had a great experience working with Mark and all his workers at Frame to Finish. We hired Frame to Finish to finish our unfinished basement space. We were limited on the space available and I was impressed with how they laid out the job. Mark was very transparent on his pricing and all aspects of how the job would move forward. We worked with a newer software program (Trello) that helped us stay connected with their progress and we knew what was needed of us and when to expect the next phase of the job to begin. The team was very professional and I would not hesitate to reach out to them again for future remodeling needs. My husband and I purchased an 8 year old home but the basement was unfinished. We wanted the basement to resemble the upstairs as much as possible . 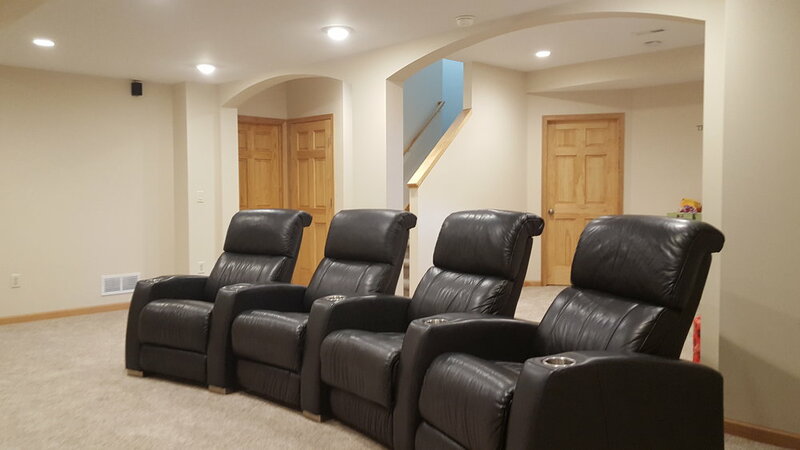 Mark was able to exceed my expectations by transforming the basement into a beautiful living space including a bedroom, full bathroom, wet bar and entertainment area. He even replicated 3 arches that were upstairs in our main living room . The entire project turned out fantastic. We couldn't have been more satisfied. After the completion of the project, I invited our realtor over to see the finished project. She said if she didn't know better, the basement looked as if it were finished at the same time the home was built. I highly recommend him to anyone you will not be disappointed. I've had the pleasure of working with Mark at Frame to Finish on multiple projects. His designs are excellent and the final results are always amazing. I highly recommend working with Frame to finish on your next project! 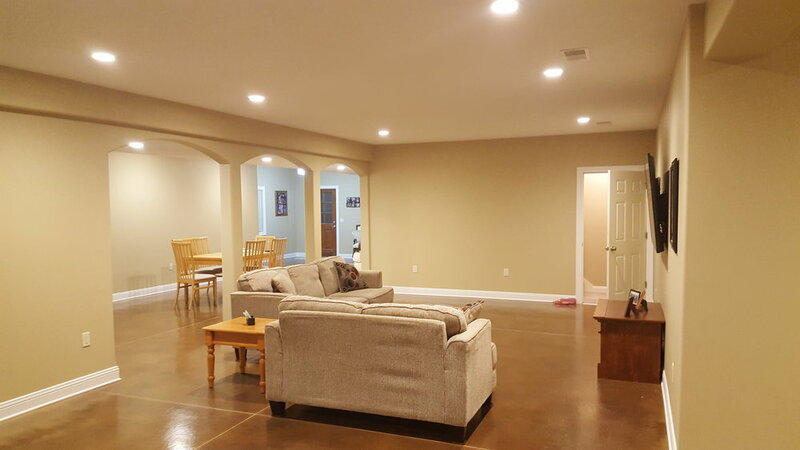 Mark and his crew did a great job on finishing our basement! We use the space so much now. He was very responsive and attentive to the project throughout. Excellent company to work with. The owner Mark helped me design the remodel. Walked me through the process and hit all the timeline dates. Mark and his crews did a fantastic job on our complicated basement project. He was honest and attentive at every step. Our experience with Mark and the Frame to Finish crew was great. He understood what we wanted and always gave us options to save some dollars! The quality of the work was great. Will definitely recommend to friends and family. Mark and his crew did a great job for us on our kitchen. Since the project was at my office, we couldn't have the kitchen down at anytime. Mark worked weekends and nights to make sure we always had use of the kitchen. And when the countertops were delayed he added plywood to make sure we could still have full use of the kitchen. Nicely done, and on budget. Mark, the owner, initially helped us remodel our kitchen after being referred from a couple with a basement remodel. When I moved forward with a detached structure near our bluff line we didn't consider any other bids because we knew Mark would make us happy. He's proven to be flexible, fair, and is able to achieve reasonable deadlines. If you work with Frame to Finish, you can trust the work will be done with care. Any problems we encountered throughout both projects were always resolved timely and met our expectations. I highly recommend this company. Our project turned out exactly the way we wanted. He is very fair and accessible.